Many of us already know the benefits of drinking plenty of water and proper hydration, but with the simple addition of fresh lemon juice you may have yourself a very healing beverage. •After a nights sleep the lemon water provides an ideal flush to the body's systems...digestive, circulatory and elimination. 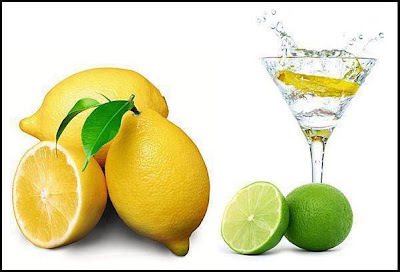 •The lemon juice in particular is a great cleanser and purifier of blood, liver and kidney's. •Lemon juice (although acidic in nature) is anionic and therefore produces an alkalizing effect on the body. This is important because the more alkaline your body is, the healthier it is. Disease states only occur when the body pH is acidic. Being alkaline also helps further the detoxification processes. •Lemon juice supports digestive function and can relieve conditions such as heartburn, indigestion, flatulence diarrhea and constipation. Make it a habit to put in cut limes/lemons (together with peel) into your drinking water or juices, to enjoy all its medicinal properties. With lemon juice in your drink, the absorbability of the other nutrients in your drink is increased up to five times! Tip: Juice a glass of either lime or lemon juice and make ice cubes out of it. When you have a drink, pop a few lime/lemon cubes into your drink for a refreshing taste while enjoying its immense health benefits. Despite all the goodness that limes/lemons provide as mentioned above, remember always to take only in moderation. More is not always better. Some people are allergic to citrus peels, so when you take lime/lemon juice extracted together with the peel, check yourself to see if there is any allergic reaction afterwards.